Six decades ago, explorers from a British firm, Atomic Energy Authority, dug around these red hills for beryl, a mineral used for alloys to make everything from springs to aircraft and missiles. It was the atomic age and they were convinced a big find of beryllium, then a hot mineral, would change their people’s fortunes. They soon abandoned the search, finding no commercially viable deposits. Years later, Zimbabwe is again at those hills near Arcturus, this time to mine proven deposits of lithium. And just as those early prospectors, there is hope that this new find will be the investment that the country needs to help turn around its fortunes. Zimbabwe is targeting to become a major global lithium player, President Emmerson Mnangagwa said on Wednesday, as he launched the first phase of development at what Australian firm Prospect Resources says will be Africa’s largest lithium mine. Arcadia mine, which will produce 2.4-million tonnes of ore a year, will be the biggest producer of lithium on the continent once it hits full production, Prospect Resources executive chairman Hugh Warner told Mnangagwa at the groundbreaking ceremony at the site, some 40km north east of Harare. With just Bikita Minerals in operation, and Zimbabwe is the world’s fifth largest lithium producer, although it is well behind the other producing nations. The new mine would be a major boon for Zimbabwe, which has been struggling to convert foreign investor interest into actual projects. How quickly Zimbabwe will help Arcadia mine to move from development to production will be a strong indicator to other foreign investors still waiting in the wings, Warner said in his speech at the event. Mnangagwa said Zimbabwe will smoothen regulations to ensure that investments are realised faster. There will also be more research into lithium. “The successful establishment of this lithium project places Zimbabwe on a positive trajectory in our pursuit to be a significant global player in the lithium mining industry. 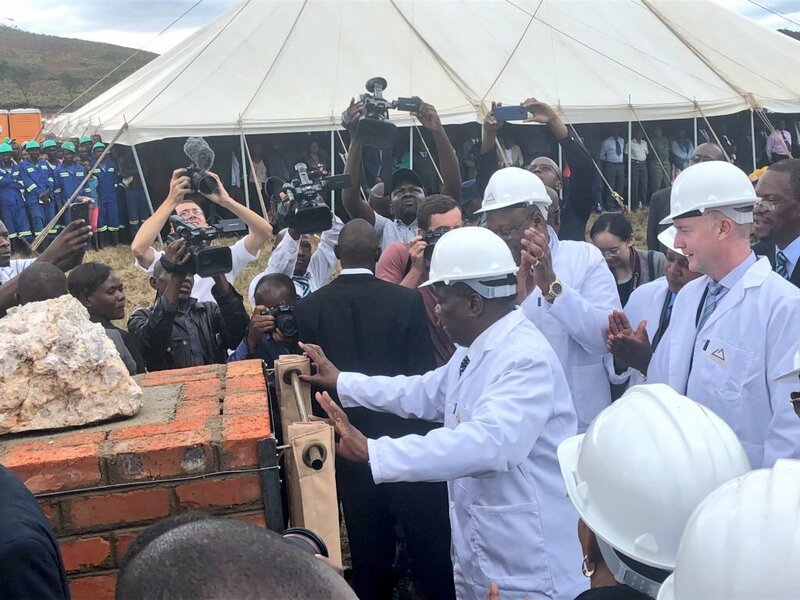 With one of the largest lithium reserves in Africa and confirmed deposits in Bikita, Goromonzi and Kamativi we are poised and ready to become the hub for research, development, exploitation and manufacturing of green energy and lithium based solutions,” Mnangagwa said. Departing from his prepared speech, Mnangagwa said the world is moving towards battery operated cars, and Zimbabwe has to invest more in researching into how it can use its lithium resources to take advantage of growing demand for electric cars. Industry officials say much of the demand for lithium-ion batteries will come from China, which will produce 4.5 million electric cars over the next two years alone. To secure a market, Prospect has signed an off-take arrangement with Shenzhen-listed Sinomine, who will buy 30% of Arcadia’s annual production over seven years. Sinomine is to pay $10 million in advance for Arcadia’s lithium concentrates. Mines Minister Winston Chitando said lithium producers in the country have set up a committee to advise Government on a lithium policy. “The lithium development committee will propose a policy to push production in terms of production and associated value addition,” said Chitando. To add value, Prospect has set up a pilot lab near Kwekwe where it has produced 99.5% battery grade lithium concentrate. The company is also considering investing in a lithium chemicals plant downstream from the new mine, which would push up its valuation. The company is targeting more Zimbabwean lithium assets. It announced recently that it had signed a 90 day option to acquire the Lipropeg Lithium Project, 16km outside Bindura, from local company Pegmaton Resources. Prospect announced recently results of a definitive feasibility study confirming that the Arcadia mine will be profitable, with forecast life of mine revenue of US$2.93 billion and average annual EBITDA of US$106 million over a 12-year mine life. The project would need capital investment of $165 million to develop a 2.4-million tonne a year operation. This is double what was carried in the pre-feasibility study in 2017, which estimated an investment of $52.5 million for a 1.2-million tonne a year mine.